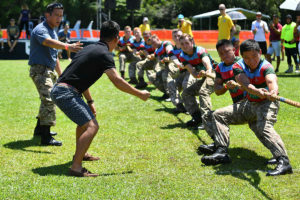 Troops from the British Forces Brunei (BFB) Garrison enjoyed the annual Highland Games run by British Shell Petroleum at the Panaga Sports Club. Soldiers from 2 Royal Gurkha Rifles and the Jungle Warfare Division were on hand to talk to members of the public about their key role here in Brunei. This year saw the 26th Panaga Highland Games. From relatively humble beginnings, the Panaga Highland Games have grown to include the whole community. Teams from BSP, the Garrison, local communities and businesses all compete together in traditional Scottish track and field events, including the ever popular Tug of War.